A Wayne Community College student is the recipient of an educational professional organization’s scholarship. The North Carolina Association of Educational Office Professionals District 12 awarded La Grange resident Keanna Necole Jackson a $500 Staples Scholarship. 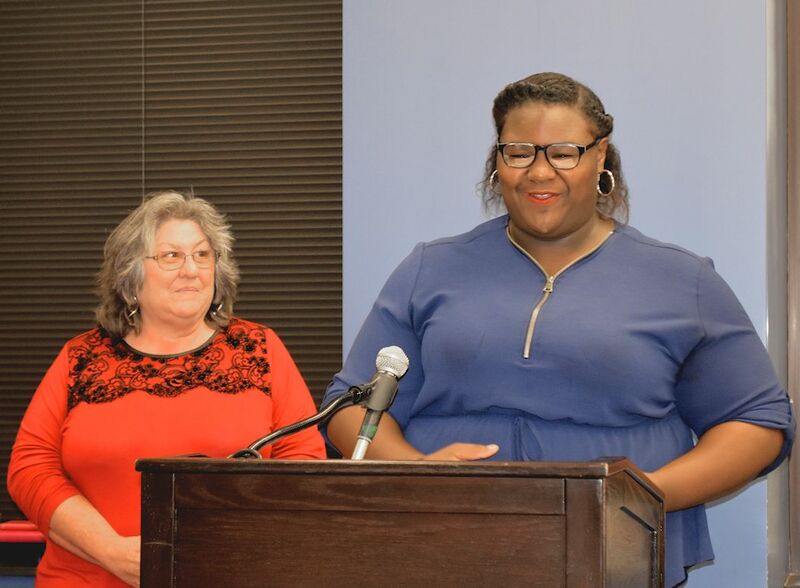 Keanna Jackson thanks the NC Association of Educational Office Professionals District 12 for selecting her for a scholarship as Bessie Wells, the organization’s Scholarship Committee Chair, looks on. Miss Jackson is an associate in arts-college transfer student who intends to continue her education to become a registered nurse. She works part time in her college’s bookstore. She is involved with her church and has volunteered with community organizations including Habitat for Humanity and the American Red Cross. NCAEOP is a professional organization of educational office personnel and administrators. It provides its members educational opportunities, a professional standards certificate program, scholarships for member and students, a legislative platform, and awards at levels from the individual unit to the state organization. NCAEOP’s District 12 is composed of units at public and private educational institutions in Carteret, Craven, Green, Jones, Lenoir, Onslow, Pamlico, and Wayne counties. The unit at Wayne Community College nominated Miss Jackson for the scholarship. Wayne Community College is a public, learning-centered institution with an open-door admission policy located in Goldsboro, N.C. As it works to develop a highly skilled and competitive workforce, the college serves 14,000 individuals annually as well as businesses, industry, and community organizations with high quality, affordable, accessible learning opportunities, including more than 70 college credit programs. WCC’s mission is to meet the educational, training, and cultural needs of the communities it serves. Follow WCC on Facebook (also @WayneCCNewsandViews), Twitter, and Instagram.